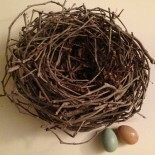 “Will you be dining alone?” | A COMPLETE, Empty Nest. I have not traveled out of the country in over 20 years, but in my younger days I was blessed to have the opportunity to travel to perhaps 10 other countries. Of course, one of the most interesting parts of my travels included the many different cuisines I got to experience. In addition, at more than one of our meals we came upon a lovely European tradition of being seated at a table with other diners we had never met before. This was popular for at least one main reason: The restaurant owner wished to completely fill as many tables as possible. Why have 4 4-seater tables with only 2 patrons each when you can have 2 completely filled tables, leaving 2 more ready to fill up. Awkward for us at first, we tried to learn what the ‘rules’ were for this arrangement. Introductions came first, followed by small talk about where we were from, where we were going to, etc… The business of ordering our meals and then later discussing what we were eating made the experience easier, and often we found we very much enjoyed the opportunity to share this experience with someone we had never met before and may never see again. Of course, throwing in language barriers always made for an especially interesting meal conversation, with a lot of pointing and attempts at a universal sign language. Given the right combination of diners, a meal could end up with a great amount of laughter! The other reason I don’t eat out as much is because eating out for me was always a social experience. I loved to connect with family and/or friends over a meal, whether it was a pizza or my favorite Japanese sushi. It was what I looked forward to at the end of a work day or on a special occasion. With no other distractions than the food in front of us, I enjoyed making that connection again. My (then) husband and I had some of our best conversations over dinner out, and there were many times when we ate out for every dinner. And so here is what I propose, restaurants of the United States: Let’s start the tradition of allowing diners to have the choice to join with someone else for a meal. I’m not saying this turns into a form of singles meeting singles for the purposes of dating. I think I could really enjoy having dinner with a woman my age, or an elderly person, or a young 20-something, or yes, on occasion, a MAN near my age. I’d like to walk into my local sushi place and be asked, “Will you be dining alone today, or would you perhaps consider having a nice meal and conversation with another person dining alone this evening?” These pairings might be all they are designed to be-an opportunity to have a nice meal and conversation while allowing the proprietor to make a little more money, but they might just turn into great friendship or relationship. Who wants to be the first to give it a try? I’d vote for this…or join you! Wonderful! And I would join YOU! If I ever own/operate a restaurant, this will definitely be a practice. BRILLIANT! I would ask to dine with someone and then hand them Henry and go to another establishment for a martini. Okay. I kid. I don’t like martinis. 🙂 Rene, come visit Kansas. We will treat you to lovely conversation and food. Scouts honor. This is a great idea. Theresa and I are doing this but in different cities. Really? Theresa is doing it here? Tell me more. This entry was posted on April 13, 2014 by renetmyers and tagged companionship, dining alone, empty nester, lonely, restaurants, single.